Back from London a few weeks ago, And a piece of my heart still yonders there, how I wish……..
London,The City where Shakespeare wrote plays, where ambitious kings and scandalous queens ruled, where world famous musicians were born, where the gentleman’s clothing the ‘suit’ was invented, where the famous forgotten glare down at you from stone horses all across the city, where the river Thames holds secrets of love and revenge, adventure and misfortune, all of it hidden but yet in full view. Before I even started exploring the touristy bits of London, it was important for a first timer like me, to experience London like a Londoner(at least this is what Tish feels)and this is exactly where one can get a real buzz. Fortunate to have someone as close as Tish living there, he knows London like the back of his hand. ‘Hiya’ his common way of greeting others, quickly latched onto me making it surprisingly easy to get by. We both share a common love for travel and food and yeah discovering London with him is what made it so special. 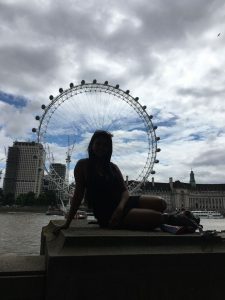 I’m sure many of you may yet wonder if I did the touristy stuff, like walk around Leicester square, Piccadilly Circus, Westminster Abbey, Big Ben, London Eye, visit the Tower of London or even shop till I drop at Oxford Street, after all my stories on choosing the off the beaten path. Well, yes of course, I did. It was fun and I enjoyed my evenings strolling down the Thames, walking the cobbled streets in Covent Garden, people watching and reveling in the spirit and culture of a place ever so vibrant and welcoming of all. London’s cosmopolitan variety extends to its cuisines, restaurants, bars, theatres and markets. One of my favourite memories was cycling through East London and reaching Tower Bridge just as the fiery orange ball sank into the river. It was pure magic, casting its spell on me, losing me in a world of hopes and dreams. 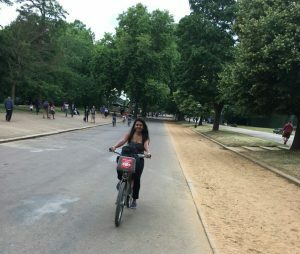 While cycling through Hyde park or strolling through Kensington Gardens where Peter Pan comes from is fun, the green carpet of Hampstead Heath is where I rolled free spirited, in the grass without a single care in the world. 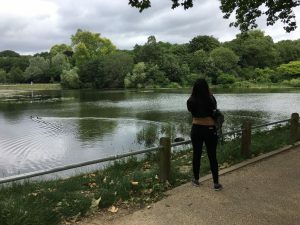 Not on any tourist map, Hampstead Heath is a huge grassland amidst ponds which makes a perfect picnic spot and a doggie paradise. Pack some wine, cheese, fruits and set yourself up for a fun day in the outdoors with your family, friends and pet. With Tish still around, it was great company plus a complimentary free guide tour .We feasted on variety of foods from traditional English fish and chips and salted roast with Cider, to Turkish adana kebaps, ekmek, baklava and ayran drink. 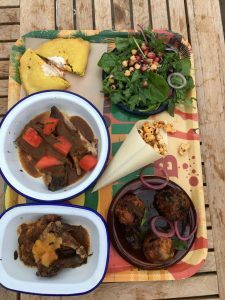 Experimented with Caribbean curry goat and Jerk Chicken, Ethiopian rice and Vietnamese pho, all dishes flawlessly put together in a menu that is both original, comforting and bursting with flavour! Being carnivorous this was my big opportunity to taste game meats and with Tish still around, I was no way letting it go off easily. We tasted crocodile, kangaroo, zebra and python at ShakaZulu and Archipelago. Being a big fan of the traditional English breakfast, each morning I chose to get my fill at one of these charming family run cafes with lots of character and a warm, personal touch, just the way I like them. Days were spent exploring the markets and the street food scene that London has to offer. London markets make great shopping destinations, selling everything from flowers and food to art and antiques (which one can have a rare find from the local charity shops),and of course cuisines from around the world. · Camden is a thriving market area. Open through the year it hosts shops selling vintage jewellery, artwork and gift items, music records and a variety of food stalls. · Borough market stacked with gourmet food, is a paradise for fruits, meats and cheese and not to miss my favourite: wine. · Portobello, tops my list in the market scene. It has been a market since the 1800s and is famous for its antiques, posters, organic breads and cheese. After feasting on the market, wander through neighbouring Notting Hill and let the magic of the movie wash over you as you chance upon the bookstore. · Greenwich market which we explored during our cruise down the Thames is bustling on weekends with vintage products, accessories and food stalls where we snacked on a fresh catch of raw oysters straight off the shell. Watching a play in one of the many theatres or a gig across London is a fun experience and if you keep your eyes open, chances are you would stump upon a free rendition somewhere nearby. Busking happens all across London’s busy streets. Enjoy the music and if you’ve up to it, step in and shake a leg just like I did to the Spanish guitar and some Latin saxophone, on one happy high night just outside Tottenham Court Road tube station. Everything said and done, it’s the people that make up the place. Almost all the people I came in contact with were warm, fun and cheerful. It was always a pleasure asking for directions, recommendations for food or indulging in casual chats. 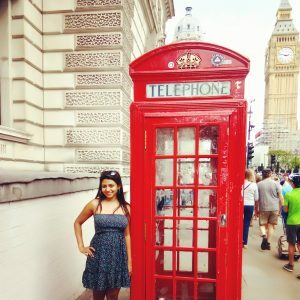 London’s transport, the tube is one of the world’s best public transport system and with the oyster card making it affordable, it’s easy to explore the quitter neighbourhoods in and around London. 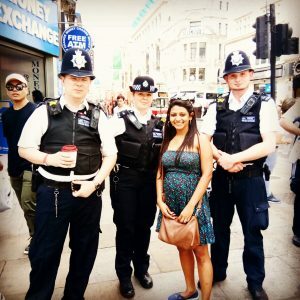 While many visitors stay within the confines of Central London, choose to go beyond for a day or two into lesser visited neighbouthoods where you will chance upon more local pubs offering you a chance to strike up conversations with localities, getting the real taste of what London has to offer. I rented an Airbnb in North London at Wood Green after much search on the net. The owner Molly was a warm woman who I chatted with much before arriving in London and her home was a wonderful surprise with the loft well converted into a cosy ensuite room with pretty colours overlooking the rose garden and giving a brilliant display of the London skyline by night overlooking the Ally Pally. On another day I took the tube and overground to Feltham, just beyond London to meet family. Not on any tourist map, the dreamy loveliness, quaint beauty and allure of the place much like the rest of England is something not to be missed. Enjoying London often quoted as one of the most expensive cities in the world, does not really mean breaking the bank. Feast on local street foods, picnic in one of the many gardens, and stroll down the Thames by night. The river runs like dark silk through the heart of the city, and the bridges dance with light. There are corners of silence in the revelry of the West End and Soho, and in the inky shadows, foxes and owls patrol Hyde Park. London does, though, have a wicked and dry sense of humor. It is clever, literate and dramatic. It is private and aloof, a sophisticated temptress, but surprisingly sentimental. Previous Post:Germany – Exploring the Road Less Travelled! 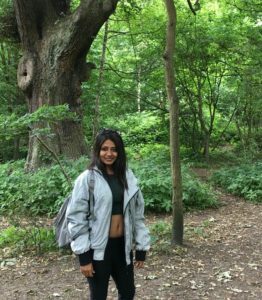 Next Post:My love affair with the English Countryside!